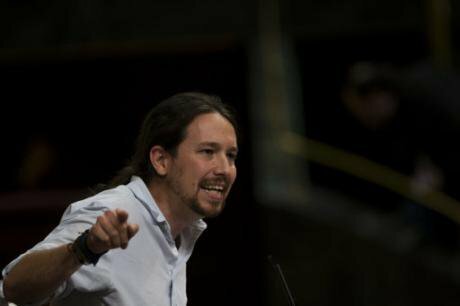 Spain's Podemos party leader, Pablo Iglesias, addresses Spain's acting conservative Prime Minister, Mariano Rajoy, at the Spanish parliament, Oct. 27, 2016. Francisco Seco AP/Press Association Images, all rights reservedWe are experiencing a 'populist moment' in Europe today. This is a turning point for our democracies, whose future depends on the response to this challenge. To address this situation, it is essential to discard the simplistic vision of the media, presenting populism as mere demagogy, and adopt an analytical perspective. I propose to follow Ernesto Laclau, who defines populism as a way to construct the political by establishing a political frontier that divides society into two camps, appealing to the mobilization of the 'underdog' against ‘those in power’. Populism is not an ideology or a political regime, and cannot be attributed to a specific programmatic content. It is compatible with different forms of government. It is a way of doing politics which can take various forms, depending on the periods and the places. It emerges when one aims at building a new subject of collective action –the people– capable of reconfiguring a social order lived as unfair. Examined from this standpoint, Europe’s recent success of populist forms of politics is the expression of a crisis of liberal-democratic politics. This is due to the convergence of several phenomena that, in recent years, have affected the conditions in which democracy is exercised. The first phenomenon is what I have proposed to call 'post-politics', referring to the blurring of political frontiers between right and left. It was the result of the consensus established between the parties of the center-right and center-left on the idea that there was no alternative to neo-liberal globalization. Under the imperative of 'modernization', they accepted diktats of globalized financial capitalism and the limits it imposed on state intervention and public policies. The role of parliaments and institutions that allow citizens to influence policy decisions was drastically reduced. The notion that represented the heart of the democratic ideal: the power of people was abandoned. Today, talking about "democracy" is only to refer to the existence of elections and the defense of human rights. This evolution, far from being a progress towards a more mature society, as it is said sometimes, undermines the very foundations of our Western model of democracy, usually designated as 'liberal democracy'. That model was the result of the articulation between two traditions. The first one is the liberal tradition of the rule of law, separation of powers and the affirmation of individual freedom. And the second one is the democratic tradition of equality and popular sovereignty. To be sure, these two political logics are ultimately irreconcilable, since there will always be a tension between the principles of freedom and equality. But that tension is constitutive of our democratic model because it guarantees pluralism. Throughout European history, it has been negotiated through an ‘agonistic’ struggle between the ‘right’, which favors freedom, and the 'left', which emphasizes equality. As the left/right frontier became more and more blurred due to the reduction of democracy to its liberal dimension, the space disappeared where that agonistic confrontation between adversaries could take place, and today the democratic aspiration can no longer find channels of expression within the traditional political framework. The 'demos', the sovereign people, has been declared a 'zombie' category and this is why we now live in 'post-democratic' societies. These changes at the political level took place within the context of a new 'neo-liberal' hegemonic formulation, characterized by a form of regulation of capitalism in which the role of financial capital is central. We have seen an exponential increase in inequality not only affecting the working-class, but also a great part of the middle-class who have entered a process of pauperization and precarization. One can therefore speak of a true phenomenon of 'oligarchization' of our societies. In those conditions of social and political crisis, a variety of populist movements has emerged rejecting post-politics and post-democracy. They claim to give back to the people the voice that has been confiscated by the elites. Regardless of the problematic forms that some of these movements may take, it is important to recognize that they are the expression of legitimate democratic aspirations. Nonetheless, the people can be constructed in very different ways and the problem is that not all are going towards a progressive direction. In several European countries, this aspiration to regain sovereignty has been captured by right-wing populist parties that have managed to construct the people through a xenophobic discourse that excludes immigrants, considered as a threat to national prosperity. These parties are constructing a people whose voice calls for a democracy aimed at exclusively defending the interests of those considered ‘true nationals’. The only way to prevent the emergence of such parties and to oppose those that already exist is through the construction of another people, promoting a progressive populist movement that is receptive to those democratic aspirations and orientates them toward a defense of equality and social justice. It is the absence of a narrative able to offer a different vocabulary to formulate these democratic demands which explains that right-wing populism has an echo in increasingly numerous social sectors. It is urgent to realize that in order to fight this kind of populism, moral condemnation and demonization of their supporters does not work. This strategy is completely counterproductive because it reinforces the anti-establishment feelings of the popular classes. Instead of disqualifying their demands, they must be formulated in a progressive way, defining the adversary as the configuration of forces that strengthen and promote the neo-liberal project. What is at stake is the constitution of a collective will that establishes a synergy between the multiplicity of social movements and political forces and whose objective is the deepening of democracy. Given that numerous social sectors suffer the effects of financialized capitalism, there is a potential for this collective will to have a transversal character that exceeds the right / left distinction as traditionally configured. To live up to the challenge that the populist moment represents for the future of democracy what is needed is a politics that reestablishes the agonistic tension between the liberal logic and the democratic logic. Despite what it is sometimes argued, it can be done without endangering the basic democratic institutions. Conceived in a progressive way, populism, far from being a perversion of democracy, constitutes the most adequate political force to recover it and expand it in today's Europe. Translated from Spanish by Teresa Sastre, member of Democracia Abierta's Volunteer Program.